General Post Office, Dublin "Ireland is too great to be unconnected with us, and too near us to be dependant on a foreign state, and too little to be independent." C.T. Grenville to the Duke of Rutland, December 3, 1784 (H.M.C. 14 report app. 1, p. 155) This statement sums up the attitude of Great Britain toward Ireland from the twelfth century to the twentieth. The Third Home Rule Bill of 1912 was opposed by the Orange Order in Ulster. A divided Ireland would cause more unrest. The 1916 Rising represented the first major demonstration of force since the United Irishmen Rising of 1798. The insurrections of 1803, 1848 and 1867 had been small in comparison. (E. A. Benian. The Cambridge History of the British Empire. London, 1959. p.663) See more below. Germany felt that England would be too busy with Ireland to enter World War I (.George W. Russell. The Irish Home Rule Convention. New York, 1917, p. 32.) “One of the immediate causes” of the war was Northern Ireland’s threat to oppose Home Rule by rebellion. The German Kaiser, as a result of the warlike attitude of the Ulsterites was convinced that England was unable to become involved in a European war. Germany was convinced that England would be too buys to enter a war or at best would be of slight hindrance to Germany. (Tom Ireland. Ireland Past & Present. New York, 1942) Ulster’s open flaunting of the laws that prohibited no arms to be sent to Ireland, and the open drilling of the Ulster Volunteers threatening a civil war in Ireland, led Germany to believe that England was weak and would not interfere if she attacked France or Russia. Germany also believed that the large numbers of Irish in the British army would revolt over the disturbances at home. John Redmon appealed to the people of Ireland as a whole to remain loyal to England. He hoped that a untied front on the part of the Irish might result in a peaceful union following the war. This probably would have worked had the leaders of Ulster cooperated withy Redmon, for during the fighting in Europe, many northern and southern Irish became friendly. Unfortunately, the leaders of Ulster would not put aside their private interests for the common good or Ireland, and the generous acts of the Irish Nationalists were to no avail. The Gaelic League was founded in 1893 for the purpose of re-establishing the Irish language and culture. The political outgrowth of the League was culminated in 1905 with the founding of the Sinn Fein movement, (We Ourselves), by Arthur Griffith. This was an organization that supported withdrawing Irish members from the British Parliament and setting up and Irish Parliament along with abandoning constitutional methods of bringing about the repeal of the 1800 Act of Union. Arthur Griffith’s plan was to follow the Hungarian example of 1861. The plan called for a boycott of the British army and navy. No Irish members were to be sent to London and an extra legal Irish Parliament to be established in Dublin. A court system would be set up, English goods boycotted and a general program of non-cooperation with the English was to be instituted. During 1910-1913, the Sinn Fein movement seemed dormant and was without a dynamic leader. (Elie Halevy. The Rule of Democracy (1905-1914). New York, 1961. p. 538.) Other Irish organizations were growing. The Irish socialist leader, Larkin had obtained many new ideas from the Industrial Workers of the World in the United States. The Irish Republican Brotherhood was revived by James Connolly. According to the author of the Irish Home Rule Convention, the Sinn Feiners placed Home Rule and other various Irish problems above a victory for the allied powers. ( George W. Russell. The Irish Home Rule Convention. New York, 1917, p. 19.) A German ship disguised as SMS Libau bringing arms and ammunition with Sir Roger Casement as leader was intercepted by the British off the Irish coast on Good Friday evening 1916 (H.B.C. Pollard, Secret Societies of Ireland. p. 147). There was a plan for a general rebellion during the Easter season. ( Lawrence M. Larson. A History of England & the British Commonwealth, New York, 1932, p. 834) Casement was captured by the British and taken to London for trial. He was later hanged. Martial law was declared in Dublin City and county. The suspension of the right of a British subject to be tried by a civil court was seen as a sign of the seriousness of the situation. Some of the Irish Nationalists in America were said to have known of the intentions of the Easter rising a few weeks before it took place. The Gaelic American stated President Wilson knew of Casement’s intentions to land arms in Ireland and warned the British government. (New York Times, April 27, 1916, pp. 1 & 4.) The Irish Republican Brotherhood had decided at the early stages of the was that a rebellion must occur at some time during the war. Professor MacNeill, the nominal leader of the group had arranged for a p;arade to be held on Easter Sunday. He later found out the parade was to be the base of the rebellion and cancelled the event. By this time, the promised aid from Germany had fallen through. In spite of MacNeill’s order, a few Irish decided to go ahead with the rising. James Connolly and Patrick Pearse were the leaders of the 1,000 man force. On April 24, 1916, the Monday after Easter, the small group took over several buildings in Dublin. Despite the great odds against them, the Irish patriots held out for about a week. Professor MacNeill, the nominal leader of the Irish Republican Brotherhood, had arranged for a parade to be held on Easter Sunday. He later found out the parade was to be the base of the rising and cancelled the event. The Easter Rising planned by the Irish Republican Brotherhood was virtually confined to Dublin. This was the opening act of the Irish War for Independence. Moreover, confusion was caused by a rash of conflicting orders sent out to the Irish Volunteers – the main strike force - from their headquarters and the decision taken by the rebel leaders to postpone their action arranged for Easter Sunday 23rd April, until the next day. 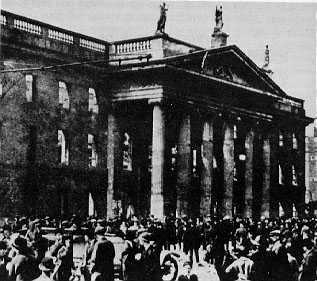 At about 11.00 am on Easter Monday, Patrick Pearse and the Volunteers, along with James Connolly and the Irish Citizen Army, assembled at various prearranged meeting points in Dublin, and before noon set out to occupy a number of imposing buildings in the inner city area. These had been selected to command the main routes into the capital, and also because of their strategic position in relation to the major military barracks. They included the General Post Office, the Four Courts, Jacob’s Factory, Boland’s Bakery, the South Dublin Union, St. Stephen’s Green and later the College of Surgeons. Photos There was little fighting on the first day since British intelligence had failed hopelessly, the properties targeted were taken virtually without resistance and immediately the rebels set about making them defensible. The GPO was the nerve center of the rebellion. It served as the rebels’ headquarters and the seat of the provisional government which they declared. Five of its members served there – Pearse, Clarke, Connolly, MacDermott and Plunkett. "As the week progressed, the fighting in some areas did become intense, characterized by prolonged, fiercely contested hand to hand street battles. Military casualties were highest at Mount Street Bridge. There, newly arrived troops made successive, tactically inept, frontal attacks on determined and disciplined volunteers occupying several strongly fortified outposts. They lost 234 men, dead or wounded while just 5 rebels died. In some instances, lapses in military discipline occurred. Soldiers were alleged to have killed 15 unarmed men in North King Street near the Four Courts during intense gun battles there on 28th and 29th April. The pacifist Francis Sheehy-Skeffington was the best- known civilian victim of the insurrection. He was arrested in Dublin on 25th April, taken to Portobello Barracks and shot by firing squad next morning without trial. In total, the Rising cost 450 persons killed, 2,614 injured, and 9 missing, almost all in Dublin. The only significant action elsewhere was at Ashbourne, 10 miles north of Dublin. Military casualties were 116 dead, 368 wounded and 9 missing, and the Irish and Dublin police forces had 16 killed and 29 wounded. A total of 254 civilians died; the high figures were largely because much of the fighting had occurred in or near densely populated areas. It is widely accepted that 64 rebels lost their lives. Their casualties were low because in the capital they were the defending force. Moreover, they fought with discipline and skill until, acting under instruction from their leaders, they surrendered their strongholds rather than fight to the last volunteer. The few other insurgents in Co. Meath, Galway and Wexford joined in the surrender. Sir John Maxwell, the British Commander-in-Chief caused sixteen of the Irish to be court-martialed and shot. The execution of these men was an attempt to murder of the Provisional Government of Ireland. Patrick Pearse was the first to be singled out for execution, he was not allowed to see his mother or brother before he was executed on May 3, 1916. One of Pearse's most famous speeches was his eulogy at the funeral of O'Donnovan Rossa who died in 1915. Following the formation of the Provisional Government, as outlined in the Proclamation, these organizations formally became known as Óglaigh na Éireann, otherwise known as the Irish Republican Army, under the command of James Connolly. Ireland, Tom. Ireland Past and Present. New York: G. P. Putnam’s Sons, 1942.